With lots of fun and games a great atmosphere spreaded over the town Hall square! 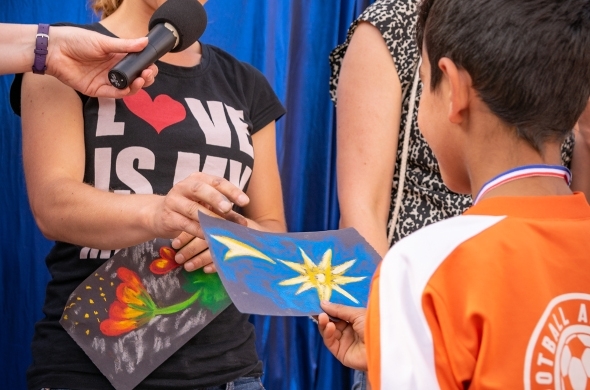 About 100 children came to our children´s party and watched excitedly the puppet theatre and dance theatre, too. "I have a friend and his name is Jesus, do you also want to become his friend..." many children, and also adults, raised their hands with red hearts to express their friendship to God and Jesus! What a brilliant day with lots of great encounters! Thank you, Jesus!! Our idea was to do a christian children´s party. Because it was the first public children's party after a long time we got very surprised. In wunderfull weather, many families and children from all social classes and nations came. The children enjoyed many different game stations such as bouncy castle, cheese board, disc shooting, fishing and a puzzle table. 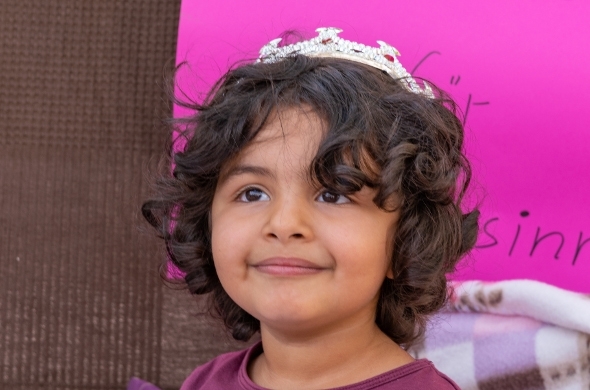 At one station, children were able to dress up as princesses and heroes. Our staff sang spontaneous and personal songs from God for them. The children faces brightened up visibly as well as their parent´s feaces. That was beautiful to see. The children were allowed to take small surprise gifts from a box. Each gift had a meaning and showed the children how valuable they are and that god loves them. The artist Linde Hals painted personal pictures. From the front she gave them away to individual children and shared their meanings with them. The recipients took them with great joy. They were touched by the so expressed thoughts of God about them. 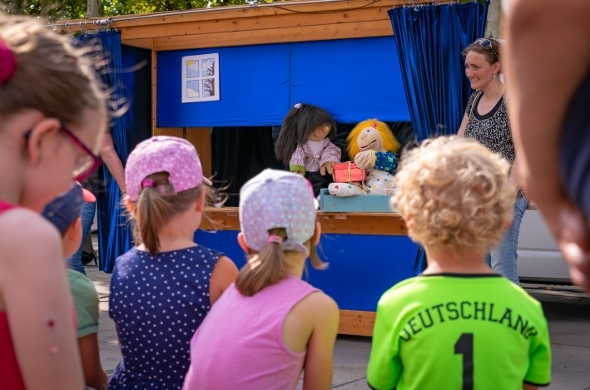 A lot of children watched the puppet theatre and dance Theatre. "Maike" celebrated her birthday, but she also gave away a gift herself. She cut out a red heart for Jesus, as a sign that she loves him. After the play we shared about the love and forgiveness of Jesus and gave the children the opportunity to invite him as a friend into their lives. Rapidly the benches emptied and many children came forward. We could pray together with them.We asked Jesus for forgiveness for all evil and invited him as a friend. We are very grateful for the successful children's party and look forward to the next time.